The Japan-Vietnam Technology Development Center of the Ministry of Science Technology and Environment has been promoting EM since 1997. En Vietnam empezo la extension de EM por medio de El Centro de desarrollo dela tecnologia Japon y Vietnam, en el Ministerio de Ciencia y Tecnologia y Medio Ambiente apartir de 1997. 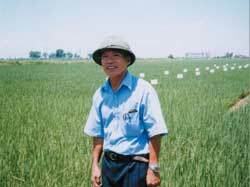 Research field of Hanoi Agriculture University. They found out that EM increased the tolerance to abnormal weather and shortened the harvesting period. El lote de ensayo en la Universidad de la Agricultura Hanoi, se observa que hay resistencia para el clima innormal y reduce el tiempo hasta la cosecha (menos tiempo de cultivo que convencional). (The report meeting in Vinn Phuc Province) Vina-Nichi Center for Technology Development under Ministry of Science, Technology and Environment takes care of the extension work of Kyusei Nature Farming and EM technology in Vietnam since introduction of this in 1997. EM extension program will be practiced as a national project in the near future because of the available results of the research which has proceeded since its introduction. 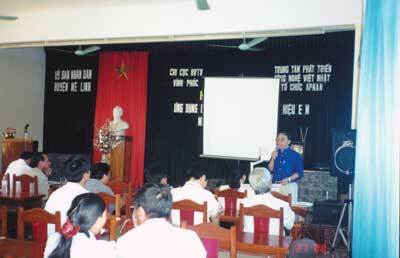 At present, the report meeting of this research was held at Vinn Phuc, Quauninn and Hoa Binn provinces in advance of this program. Many number of participants from Vietnam participated in the international workshops in Saraburi, Thailand. (Esta presentando el reporte en la Provincia de Vinn Phuc) El centro de Vina-Nichi, el cual es una agencia del Ministerio de Tecnologia de Ciencia y Ambiente, esta oficina encargada de extension de la tecnologia de EM en Vietnam desde 1997. Al momento de introducir la tecnologia de EM en Vietnam, empezo varias investigaciones en las estaciones experimentales y con estos resultados, va a comenzar el proyecto de extencion de EM por nivel de estado, anteriormente realizaron la presentacion de los resultados de experimentos en las Provincias de Vinn Phuc, de Quauninn, y Hoa Binn, ademas hay muchas participantes de Vietnam para el taller internacional en Saraburi, Tailandia. 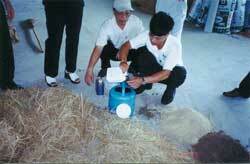 Participating Vietnamese gets training on how to make EM Bokashi at the international workshop in Saraburi, Thailand. La participante vietnamita que esta practicando el bokashi en el taller internacional que realizaron en Saraburi, Tailandia.